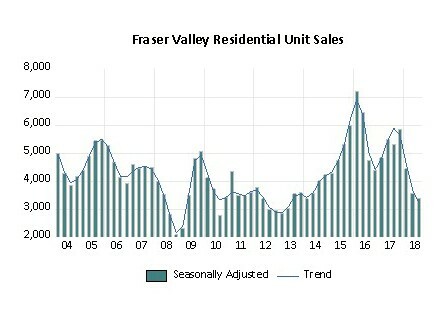 FVREB - SURREY, BC – After three consecutive years of total annual sales surpassing 20,000 units, 2018 saw the Fraser Valley real estate market return to more typical levels for both sales and inventory. For inventory, a total of 32,058 new listings were received by the Board’s MLS® system in 2018. This was the ninth-highest total for new inventory in the Board’s history. Single Family Detached: At $965,300, the Benchmark price for a single family detached home in the Fraser Valley decreased 1.1 per cent compared to November 2018 and decreased 1.5 per cent compared to December 2017. Townhomes: At $531,900, the Benchmark price for a townhome in the Fraser Valley in the Fraser Valley decreased 0.2 per cent compared to November 2018 and increased 3.7 per cent compared to December 2017. Apartments: At $418,300, the Benchmark price for apartments/condos in the Fraser Valley decreased 1 per cent compared to November 2018 and increased 7.6 per cent compared to December 2017.